Tank update still havent found a filter that I like the way it looks! So far I love the shimmer and the colors seem to pop so much more than the current usa. Stuff was growing but I think this will provide much more growth and visual appeal. 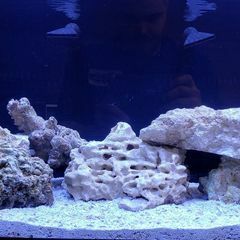 Yep I bought 3 A160we to mount between some T5 for a 225 gallon tank I am having resealed. And that build is going to be months before it gets wet so I figured I would throw 2 on here and see what I think. 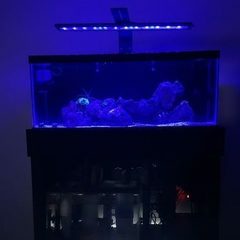 Levels are starting to balance out I have just been doing my regular water changes and trying to just let it do its thing its a young tank and I am learning quickly that nothing good in this hobby happens fast.... But I did upgrade the lighting on this one. Not very often do I get to be happy for being wrong but this time it was nice! So........I have discovered the source of my problem....... Turn out the Mathews Shrimp molt is much more "solid" than my cleaner shrimp and I jumped straight to he was gone because he was under a different rock. He come out today during feeding and is good to go. Man feel like a fool but it's better then having lost my shrimp. I would have been eyeballing this method for a while now would love to win free test kit. Great video by the way lots of good information. The biggest swing in temp I have noticed is 1.2 degrees. Have a temp controller on the way just to help a little bit. Alk is right around 9 and calcium has been kind of low around 360 to 380 ppm doing a little more frequent water changes to get it up around the 400 to 420. The clown is a fairly good size Dawrin Clown its say a few inches long. I had the cleaner shrimp then after he passed (rest his soul) I got the Pistol Shrimp. One thing I will say the cleaner shrimp did try to "clean" the clown a lot and then the Pistol Shrimp happened to dig under the rock that holds the shelf it hangs out under a lot. Could my clown have a taste for blood. I have a temp controller that will be here next week and I am going to try and get the phosphates under control. I have had 2 shrimp die in my tank.... First was a cleaner shrimp. He was in the tank for 2 months was eating and acting normal then came into work and he was almost in 2 pieces. Then today I came in and my Mathews Shrimp was curled up and gone. I preformed tests after the first ammonia 0 nitrate less than 1 ppm salinity 1.024 temp 77 (noted them in my log) Yesterday I added a new Royal Gramma and tested water Nitrate 5 - 10ppm salinity 1.025 temp 77.6 but my phosphates were like 2 ppm. I haven't had and issue with phosphates before but I had a skimmer run over one night and dump the skimmate in the sump. So I assumed that this caused my levels to spike. I plan to do water tomorrow and test the water. Would the phosphates kill the shrimp without much affect on the life? The rest seem fine but I am rookie so who knows. Plan to do two water changes this week, one today and one Thursday to bring up the calcium. I did get a Red Sea Test Kit and here is the results will retest the tank after the water change. Tank Water Salinity 1.024 Ca2 370 PPM Mg 1400 PPM Alk 8 dKH Mixed Water (Red Sea Coral Pro) Salinity 1.026 Ca2 430 PPM Mg 1480 Alk 12.3 This guy is ready for my testing to me done and for me to feed him. Tested this morning and CA2 was still at 340 PPM ph 8.2 KH 8 dKH.... this leads me to believe that the problem is not the corals consumption of calcium. I did buy another bucket of Red Sea salt and plan to do a water change to day and see what the water test out at before I add it. 16 right now don't plan to add any more coral. I considered it I am really interested in a couple T5 bulbs mixed with the orbit.